Ah, coffee ice cream. It can be a challenge to make or find a good one: Sometimes too bitter, or too much grit. Sometimes too sweet. Sometimes too un-coffee-like in flavor due to strange freeze-dried coffee or espresso powders. Sometimes too weak in coffee flavor. But the recipe by Elise of Simply Recipes encouraged me to persevere. 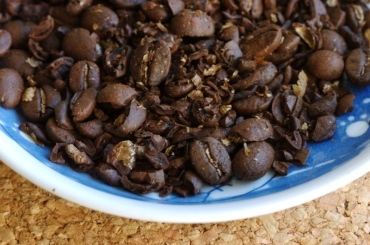 Rather than using whole beans, I lightly crushed them, increasing the surface area and reducing the steeping time. I also stirred in a leetle heent of chocolate. The chocolate is barely detectable, if at all, but that’s expected, since its purpose is to subtly soften the edge of the coffee. One of my wacky food combo pleasures is to use coffee ice cream in root beer floats. Somehow the complexity of root beer harmonizes with the roasty assertiveness of coffee. Oh yes. >:-) Of course, coffee ice cream with seltzer (fizzy) water makes a delightful drink as well. 3/4 cup whole roasted coffee beans; e.g., I’ve used a lightly roasted organic variety from El Salvador. 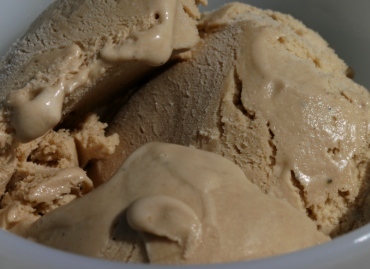 The caffeine from the coffee does get into the ice cream, so you could also use decaffeinated beans to avoid The Buzz. 1/4 cup plus 1 tablespoon sugar; adjust to taste. 1/2 to 1 ounce bittersweet chocolate, chopped; Guittard or Valrhona are good choices. Lightly crush the coffee beans. You can do this several ways: Placing beans in a bag, then smash them with a rolling pin or hammer. Or, pulsing very briefly (in two or three small batches) in a coffee grinder. The particle size should be roughly 1/8 to 1/4 inch (2mm to 5mm), but it’s okay if there are a few whole beans or smaller bits. The photo above is a visual example of what to aim for. Place the crushed coffee into a sauce pan. Add the remaining ingredients except for the egg yolks into the sauce pan, and heat until scalding but not boiling, stirring to ensure that the sugar dissolves and chocolate melts. Turn the heat off, and allow to sit at room temperature for 10 minutes. Increase or decrease the steeping time to accommodate your taste in coffee strength. Temper the egg yolks by slowly pouring (in a thin stream) a ladle or two of the hot cream mixture, mixing quickly with a whisk. Don’t worry if you get some coffee chunks in there. Pour the egg mixture into the sauce pan with the cream. Turn on the heat again, and whisk until it becomes a custard: Test by either temperature (170F to 175F degrees) or spoon method (coats spoon and a line drawn through doesn’t droop). Remove from heat, and filter out the coffee beans with a fine sieve. Chill in the refrigerator for at least 6 hours, or overnight. Prepare according to your ice cream maker’s instructions. It should churn for about 20 to 25 minutes, using an electric maker with a gel canister. This should yield just under 1 quart. Scoop the ice cream into a storage container, then place it in the freezer for an hour or two to firm up before serving. This was written by sairuh. Posted on Sunday, August 5, 2007, at 10:25 am. Filed under Food. Tagged coffee, ice cream, recipe. Bookmark the permalink. Follow comments here with the RSS feed. Post a comment or leave a trackback.